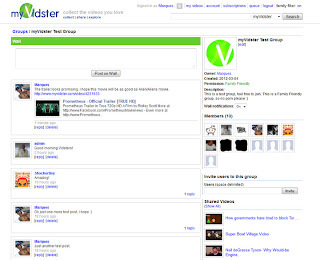 MyVidster Developer Blog: New Feature: myVidster Group Pages! New Feature: myVidster Group Pages! Greetings Vidsters! It has been over a month since my last blog post and during that time I have been collecting your suggestions and feedback. Most of your feedback revolve around the theme bring users together. Users requested chat rooms, a discussion board and I have received emails of users seeking other users of similar interests. While setting up chat rooms or a discussion board would be easy to do, I did not feel that it would integrate well with myVidster. This lead me to a group page solution. Users can create a group page on any subject they are interested in and use that page to attract and build a community. Here is break down of the features. Group Pages, one page to rule them all! Members can post to the wall and if they desire provide link(s) to myVidster video bookmarks to share to the group. When you provide the link(s), the thumbnail, title and description from the video bookmark will be added to the wall post. Replying to a wall post is also supported. Members can share a video channel to the group. This is a easy way for members to automatically share videos to other members. It is also recommended that you share a channel that contains videos that are directly related to the group. When adding a feature it needs to be integrated if you expect users to use it! Notifications are sent out to the members when a new wall post is created. You can auto post a video bookmark to the group's wall by using the video bookmark's share button. 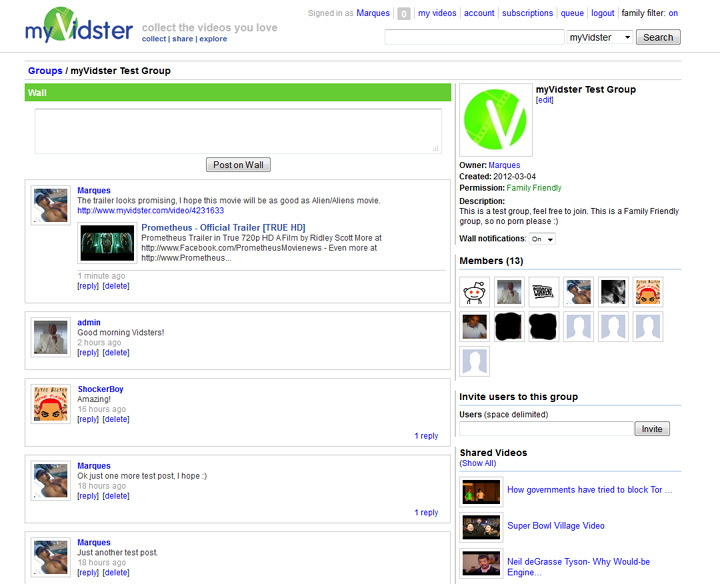 myVidster's search engine now supports group search. Select groups in the search drop down to perform a group search. Currently the only administration task the group owner can do is delete member's wall posts. Future updates will include giving group owner the ability to manage members and add moderators. Users will also be given the option to add the group's shared videos to their video subscriptions. For the curious I have created a test group page, feel free to join it. I do encourage active users to create their own group page. Well that is it for now, as always keep providing the feedback. Awesome awesome awesome! As always Marques, you rock! The major problem of the health care system is an increasing number of uninsured persons. This problem is growing because of enterprises cutting back on private coverage, high level of unemployment; the rate of being uninsured in families with incomes below the poverty line is higher. Reforming the US health care system must involve improving of the quality, decreasing of escalating costs and a huge number of Americans without insurance. health care essay for more details. Android is related to java but it all depends on us how we treated java in that technology, I was also afraid from java but after learning android course my hesitation was off. May be it is because of good tutor that he makes my mind as good that now I am not afraid of java. Regardless of exactly how you determine to check in to Zoosk, zoosklogin.org Zoosk has actually also created really fast in the last few years. This is one of the most impressive posts that I have across in recent times and one that will really help the future generations to write better and this new innovation will be a book to human kind in future that is my believe. If you want to write better you can take the help of PenMyPaper who through it’s various examples can very well help in making your write ups the best in it’s class. Writing code is a skill that needs to be developed like any other craft. Start simple, and do it. Watching other people writing code isn’t enough. Adjusting other peoples’ code isn’t enough. You have to write your own code, that solves your own logistical problems. They can be made up problems, but the practice of problem solving is the fundamental basis of coding. As you might know Spring and Hibernate both are Java based frameworks, so in order to learn those, no doubt Java is mandatory. Being a Java beginner you must have completed the Core Java. I think for your better understanding you should learn Spring and Hibernate only after you finish with Advance Java. I completely appreciate the sort of writing your site produces. The articles at your site deliver some great information-rich content with improved writing skills. I've bookmarked your site already and I'll definitely visit once again as soon as any new update comes in regarding MyVidster. Wish you good luck. Students now have the option to take Do My Assignment services online from the well-qualified writers of AustraliaAssignmentHelp.com. Our experts have more than 10+ years of experience and hold a masters or Ph.D. degree. Hire now our web portal. There are many peoples in Sydney worried about their safety but the Sydney Bus Hire give them a quality service and safety while travel with the buses.